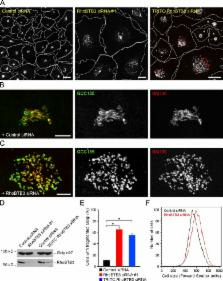 The Golgi protein RhoBTB3 in complex with CUL3 and RBX1 promotes Cyclin E ubiquitylation to allow its turnover during S phase and progression through the cell cycle. Rho GTPases: biochemistry and biology. Approximately one percent of the human genome encodes proteins that either regulate or are regulated by direct interaction with members of the Rho family of small GTPases. Through a series of complex biochemical networks, these highly conserved molecular switches control some of the most fundamental processes of cell biology common to all eukaryotes, including morphogenesis, polarity, movement, and cell division. In the first part of this review, we present the best characterized of these biochemical pathways; in the second part, we attempt to integrate these molecular details into a biological context. Function and regulation of cullin-RING ubiquitin ligases. Cullin-RING complexes comprise the largest known class of ubiquitin ligases. Owing to the great diversity of their substrate-receptor subunits, it is possible that there are hundreds of distinct cullin-RING ubiquitin ligases in eukaryotic cells, which establishes these enzymes as key mediators of post-translational protein regulation. In this review, we focus on the composition, regulation and function of cullin-RING ligases, and describe how these enzymes can be characterized by a set of general principles. The RAS oncogenes were identified almost 20 years ago. Since then, we have learnt that they are members of a large family of small GTPases that bind GTP and hydrolyse it to GDP. This is then exchanged for GTP and the cycle is repeated. The switching between these two states regulates a wide range of cellular processes. A branch of the RAS family--the RHO proteins--is also involved in cancer, but what is the role of these proteins and would they make good therapeutic targets? Proliferating cell nuclear antigen (PCNA)-associated KIAA0101/PAF15 protein is a cell cycle-regulated anaphase-promoting complex/cyclosome substrate. Effects of guanine nucleotide depletion on cell cycle progression in human T lymphocytes.